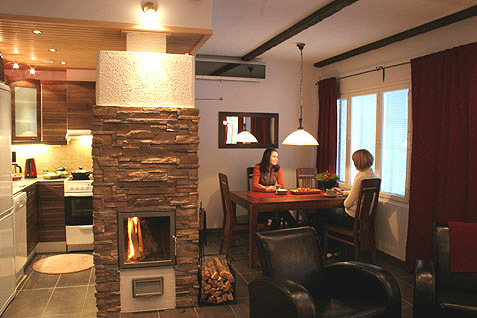 This masonry/wood holiday home located in Vuokatti ski centre was completed in February 2007 (end apartment). Floor area 79 m². 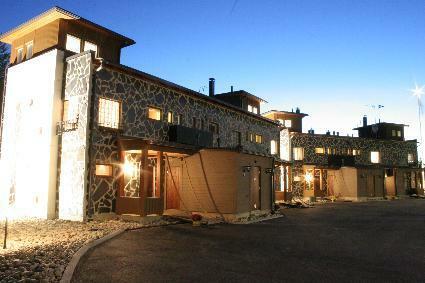 On the ground floor there is combined living room & kitchen with sofa-bed, sauna (electric heating), washroom and toilet. 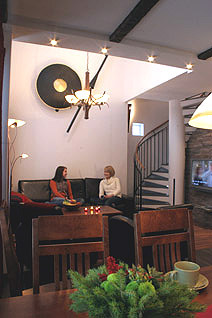 Upstairs there is two bedrooms, one with twin bed, the other with separate beds for two, bathroom with whirlpool bath. One bedroom with twin bed in the spire. Glazed terrace and balcony as well as storageroom. Check in at 6 p.m. on arrival day and departure at 2 p.m. on departure day. Internet Access. Kajaani 33 km, Sotkamo 7 km. Vuokatti ski slope 140 m, cross country track 150 m. Small lake 1,5 km. Internet-connection (wireless, speed 4 Mb). Linen can be booked for additional fee. No pets allowed.